Collaboration makes the world go ‘round. Or, at least, it made possible last week’s ambitious program Those Who Do Not Move at Roulette in downtown Brooklyn. 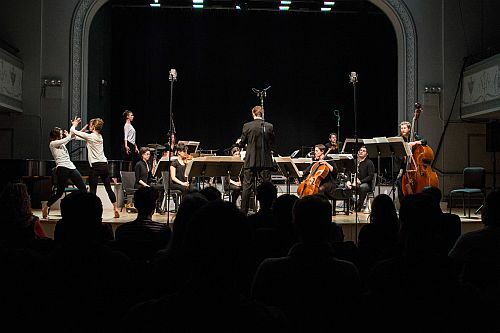 The creative combination of musicians, composers, and dancers reflected a unique aspect of the New York new music scene: great things happen when groups combine forces and bring together the best that each can offer. The results make a rich fabric, and generally attract a fuller and more extensive audience to embrace it, exuberantly. Ensemble Sospeso, the pioneering player in the 1990s New York new-music scene (with a curatorially European slant) provided the baton of its innovative music director, Nicholas De Maison. Under his leadership, the musicians harked from the newly founded (and youthful) Ensemble Moto Perpetuo—all made possible under the umbrella of Amelia Lukas’ Ear Heart Music, the imaginative, boundary-bending series. And to bridge the gap between sound and space, composer/choreographer Miro Magloire and the dancers from his New Chamber Ballet responded with bodily theater scattered in and around the chamber group in the final work, Those Who Do Not Move (do not notice their chains) by Lewis Nielson. But to begin, the audience itself was brought into the fold for French composer Mark André’s da (2008), with eight musicians positioned in a circle spaced throughout the hall with conductor poised behind the audience, keeping things together. On stage, the bassoon, played by Hazy Malcomson, sat triumphantly at the center flanked by pianist and bass. As the lead instrument of this soundscape-driven and texturally focused piece, the bassoon takes the other seven musicians on an ascent, starting with the ephemeral and building to the punctuated—finally climaxing in a noisy but controlled pinnacle. But depending on where you sat, your own experience might be quite intimate, outside the alpha bassoon’s orbit. In my case, I was seated at the left corridor by the violinist, Maya Bennardo, whose differing techniques of delicate plucks and occasional use of a credit card to resonate the strings had my rapt attention. Harking from England, the towering Simon Bainbridge was present for the United States premiere of his Tenebrae (2009), a partnership of dual quartets—four male singers and a conventional string quartet—in a response to Paul Celan’s title poem, which evokes a struggle with faith by a prisoner in a German death camp. Bainbridge’s density and emotional content clearly demand both sophistication and intuitive interpretation. While the four singers blended their voices in a balanced weaving of melody, spoken word and layered expressive content, the quartet was too focused on their individual parts and not enough on their role as instrumental collaborators. Nevertheless, the work’s power and unbridled passion tapped by all involved left the audience mesmerized. The world premiere of Nielson’s latest opus incorporated all personnel, with a more extensive instrumentation of 12 people (including two on percussion, one bass guitar, and David Bird driving the electronics). This eclectically bombastic piece built upon a range of elastic sounds, neoclassical snippets, recorded German texts, and Rite of Spring foundations, and was performed along with the response of Magloire’s choreographic interpretation, realized by three female dancers in flowing white t-shirts and black leggings. The dancers evoked intertwined power plays—at one instance, one standing amidst the wind section would pull on another at the front of the stage, as if with an invisible cord. But also De Maison himself ended the piece aggressively pulling at the heads of his musicians, who complying by bowing them up and down, showing that those who do not move are, in fact, moving at the control of someone more powerful and authoritative.